Thor Laser Therapy uses infrared light, to trigger healing at the cellular level in your body. Officially called Thor Low Level Laser Therapy or LLLT, the therapy is ideal for joint and tendon problems. The infrared light beams penetrate into the dense tendons, the fascia and the joints, and stimulate the healing process. You may also have heard the term “Cold Laser” as an alternative name for this technology. When is Thor Laser Therapy used? We will always give you a detailed diagnosis first. Understanding the underlying causes of your pain or condition is the starting point to recommend a personalised treatment plan. It may include exercises, orthotics, skin and nail treatments, PowerPlate neural stimulation, and Thor Laser Therapy. 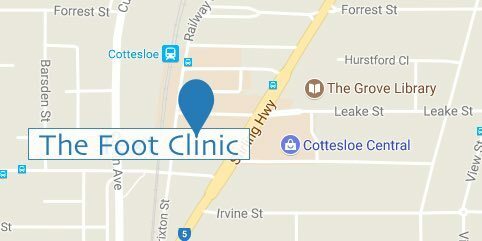 At The Foot Clinic, your podiatrist may include infrared light sessions at the clinic as part of your treatment, if you suffer from any injuries to tendons, muscles, nerves or skin. It can also be used to manage nerve pain symptoms, caused by osteoarthritis. And if you have nerve damage or poor blood circulation as a result of diabetes, Thor Laser Therapy is used to stimulate the nerves and preserve or increase blood stimulation in those areas. Heel or ankle pain can be caused by a number of problems. From injury to the Plantar Fascia or Achilles Tendinopathy, there are multiple reasons you are experiencing heel or ankle pain. Physitrack is an intergrated exercise program that has an online library with over 900 videos that narrate and take you through a range of suitable exercise videos to help with your treatment. Because the infrared light penetrates deeply into tendons and bones, it can also stimulate the healing process if you have suffered a break or a stress fracture of the foot or the lower leg bones. Laser or infrared light is also often used following a surgical procedure, to speed up recovery, reduce pain and prevent any swelling. And also to optimise the healing of ulcers and wounds on the foot. 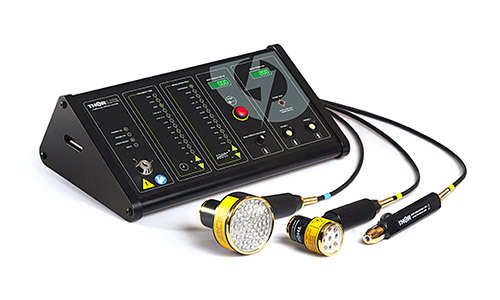 Thor Laser Therapy is a cold laser therapy, and it will not burn your skin. 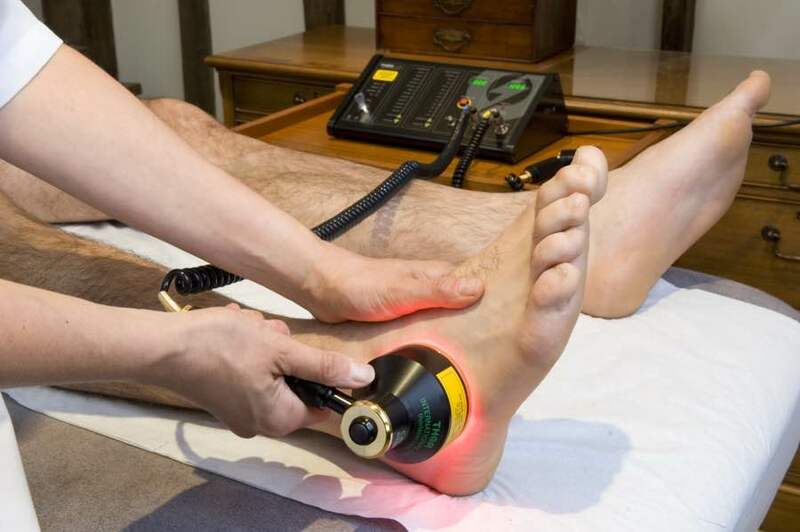 It’s a safe, medically approved laser with an invisible beam that does the actual work, and visible red light to help your podiatrist point the laser at the right areas. A typical cold laser treatment takes up to 15 minutes and is repeated over a couple of weeks until your recovery has progressed. Pain usually indicates damage at a cellular level. Cold laser or Thor Laser Therapy can penetrate the cell walls and stimulate the activities inside the cells. What the infrared light actually does, is stimulating the enzymes, so they exchange chemicals more efficiently. It’s like adding “fuel to the fire”: the laser light catalyses the cellular energy cycle. As a result, the cells in the area that needed attention will produce more Adenosine Triphosphate (ATP) as they release nitrogen and oxygen. It’s this chemical process we want to stimulate because it supports overall tissue repair in the human body. The low level laser beam also helps dilate blood vessels. This makes it a very useful treatment option in diabetic foot care, for patients who suffer from poor blood circulation and wounds or ulcers. In general, improving circulation inside deep tissues helps the whole healing and recovery process. At The Foot Clinic, you will notice that we use the latest, innovative technology. As a team of experienced practitioners, we also keep furthering our education in all areas of podiatry. We have a simple mission: to fix your feet, and to build better bodies, from the feet up. Combined with this passion for the latest, reliable and innovative technology, we thrive on giving you a high quality service experience. Our team of friendly podiatrists will be happy to answer any questions you may have, on your overall foot health or any of the treatments that we offer.